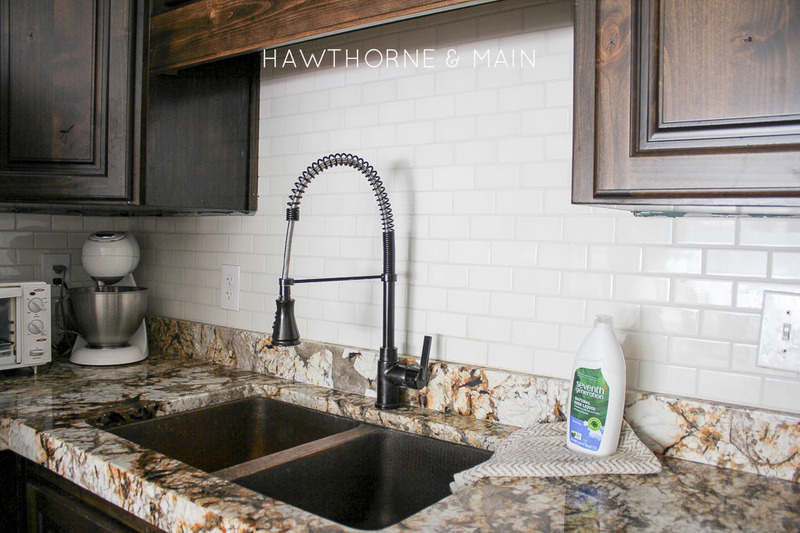 My Favorite Space is back for another round, and today I am so thrilled to have my friend Shonee from Hawthorne & Main here to share her beautiful kitchen! 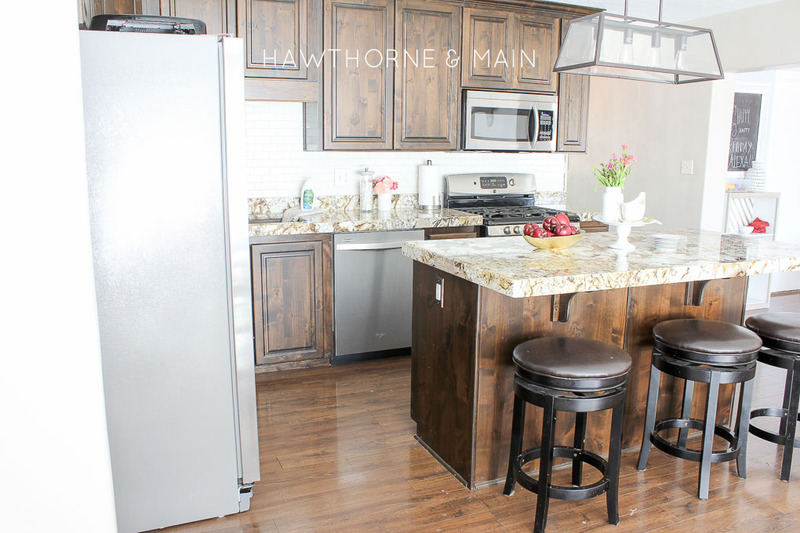 She and her husband completely transformed this space from what it was when they first moved into their house, and it is so fun to see how all of their hard work paid off. Here’s Shonee! Hello Just a Girl and Her Blog readers!! 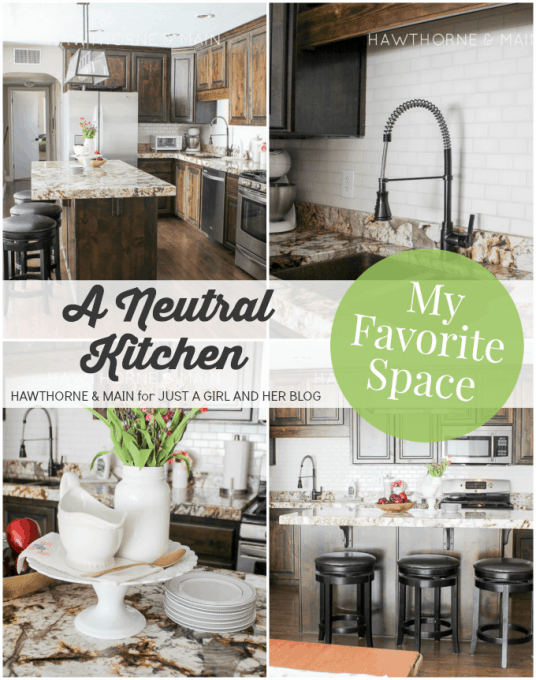 I am honored to be here sharing my favorite room, my warm, neutral kitchen!! This series has been so fun! I have loved all of the rooms, so much inspiration. Let me first introduce myself! 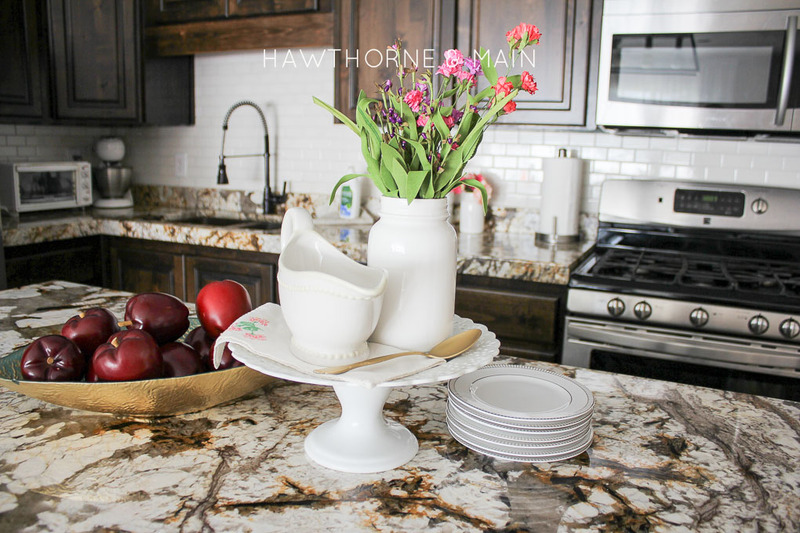 My name is Shonee and I blog over at Hawthorne & Main. We bought an old 1950’s house a couple of years ago and we are working through the house room by room to make it our own. Well…. in all actuality we are doing bits and pieces of every room all at them same time in hopes that we will have something amazing once we are done! I love to decorate. One the blog I share rustic modern DIY projects among other things that inspire me. I recently shared some big news that we are again doing another round of IVF! I am scared and excited all at the same time! Let me show you my kitchen!! What is the main function of the space? My favorite room in our house right now is our kitchen. When we bought this house a couple of years ago, we knew that the kitchen needed a total overhaul. The bright blue counters and lime green glass cabinets just weren’t my thing. Can you tell us about some of the fun DIY elements in the space? I guess you could say I have always been a DIY’er at heart. It wasn’t until we bought this house that my DIY skills really came to life though. You really need to see the before pictures to see where this room began, it almost doesn’t even look like the same space. We tore out walls and even part of the ceiling, all DIY style. He knows me all too well. I am no perfectionist and work at lightning speeds….. sometimes quality control can suffer a bit. I will say I think we did an excellent job! Plus, I feel like if we can do this tile job anyone can! How would you describe your design style, and which elements in the room help bring that to life? My design style is a work in progress, to be honest. Lately I have been getting down on myself because I feel I have not pinned down what my style truly is. It is very easy for me copy others. I think getting inspiration from others is fine and I totally love doing that. But, I am still working on getting a feel for what MY style is. It all takes time and I am trying to be ok with that. Right now I would say my style is all about rustic neutrals. I love color so it is weird that I don’t use a lot of color in my house. Hopefully that will change. What is it about the space that makes it your favorite? For our family, food and fun sort of go hand in hand. When we were designing the kitchen I knew that I wanted to have an open kitchen were I could still be a part of the party even while cooking. I have loved that about this space. We were debating about whether we should put an island in. I am so glad we did!! We also knew we wanted something different for the counters. This slab totally fits in the unique category. It really steals the show in here and we love it! It has been such a pleasure to be here with you today. Thank you so much for having me Abby!! I am a huge Pineretest and Instagram fanatic. I would love for you to come stop by Hawthorne & Main and say Hi! Such a beautiful space, right?! 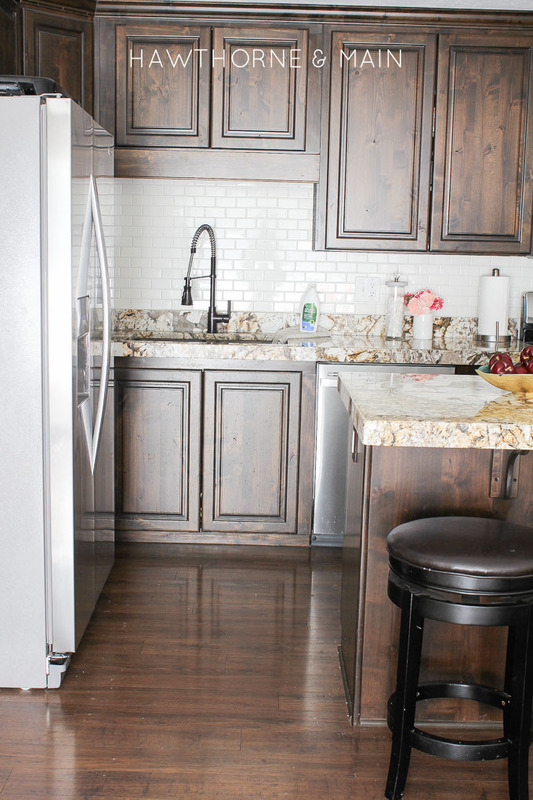 Thank you so much for sharing your gorgeous kitchen with us, Shonee, and thank YOU for reading! Have a wonderful day! Oh Shonee, I absolutely adore this kitchen! 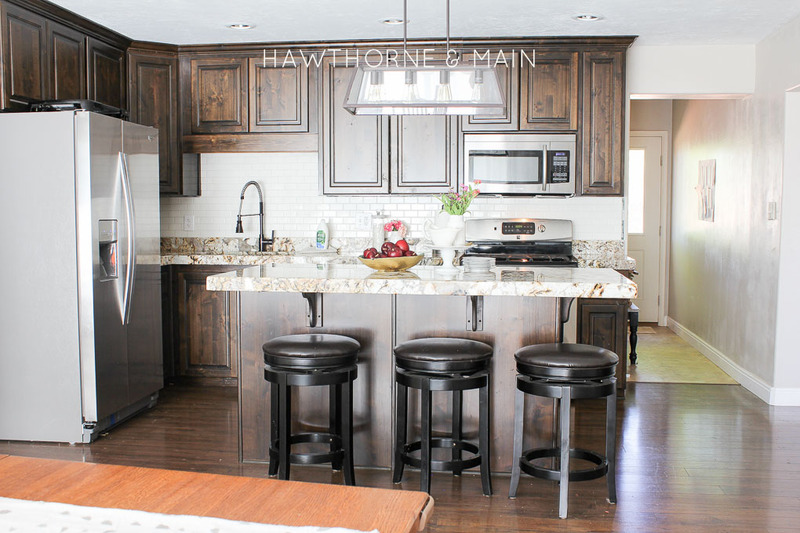 You know I’m digging those rich wood cabinets and that backsplash looks amazing girl! 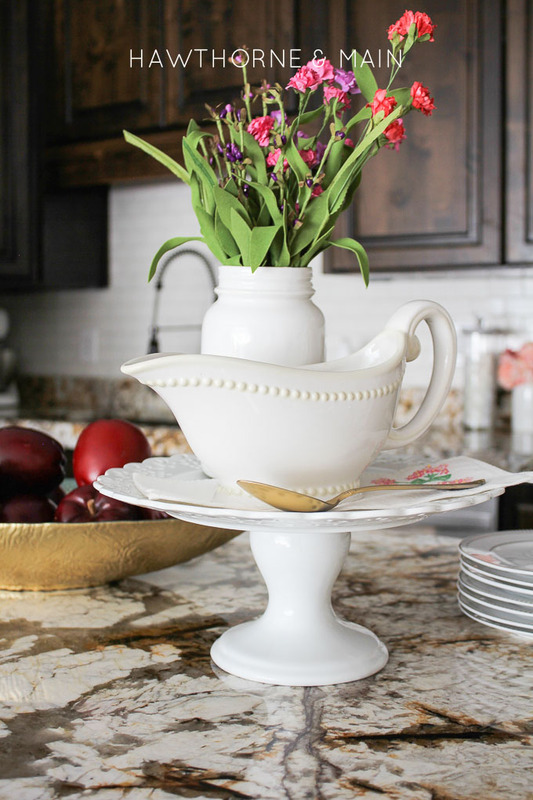 I can totally relate to the frustration of not being able to pin down my own style – we’re finding it quite difficult to make decisions for our home renos as we don’t yet have a clear picture of what exactly we want things to look like. It’s definitely forced us to slow down as we work our way through the house, but it really is a ton of fun to watch it all come together when we do finally make some decisions! Shonee, I’m drooling over your kitchen! Absolutely love every little detail! 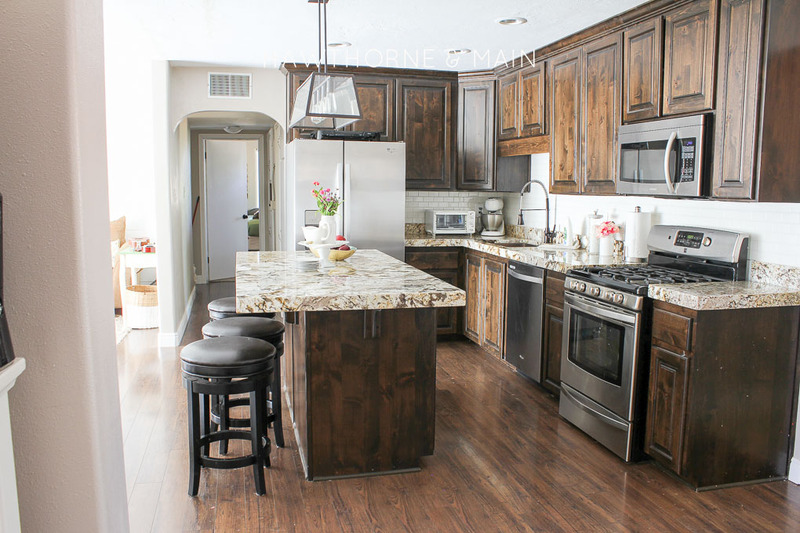 LOVE LOVE LOVE this kitchen! 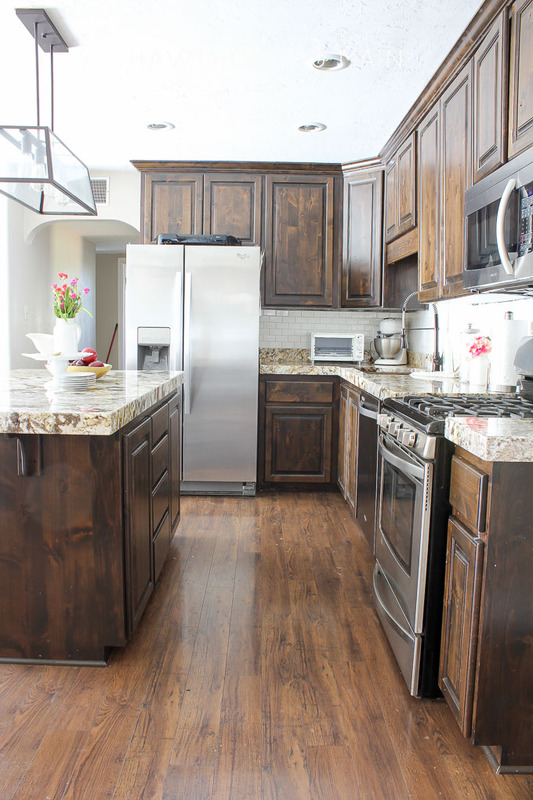 Those cabinets are amazing & they really just match the counter tops so well! Pinning!